One very avid waterfowler realizes the 230 species of wildlife supported by California riceland, including 50 species of waterbirds, need protection. Straight talk, from real farmers, in their own words. Today, consumers have many questions about agriculture and there seems to be no shortage of so-called experts willing to talk to them about the subject. Often, in our crowded world of traditional and social media, it is only the most outrageous headlines that are noticed, but not necessarily the most accurate. So, we asked a group of farmers if they would be willing to speak to you about agriculture. Several producers took us up on our offer. Each month we will feature one of their stories in an on-going series called “Why We Care”. They will talk about everything from food safety to renewable energy. It’s straight talk, from real farmers and ranchers, in their own words. We encourage you to read and comment on these stories and to share them with others. Nicole Montna Van Vleck, managing partner of Montna Farms. Regardless of whether I’m in the office seeing them from my window or sitting in a duck blind watching them fly in, the huge flocks of birds that are migrating through the Sacramento Valley of California are an amazing sight. 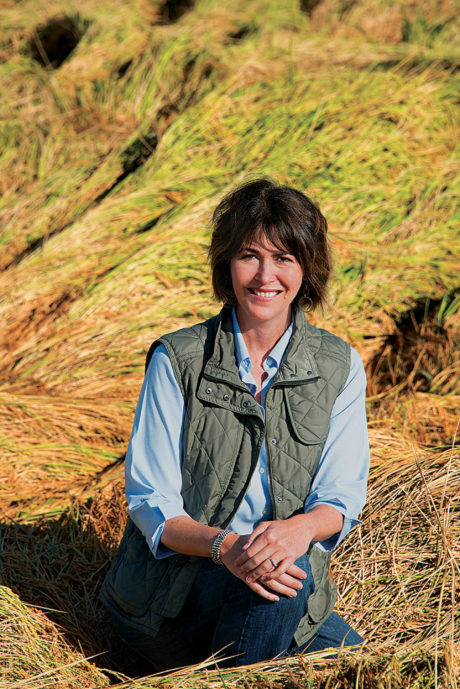 We farm about 5,000 acres of rice in Sutter County, in the heart of the Sacramento Valley. Wildlife is a big part of our operation — we like to say we’re in a rice/bird/fish rotation. It’s a very symbiotic relationship. Part of the reason is my father, Al Montna, is a very avid waterfowler. He realized how valuable this habitat is, especially at our Dingville ranch. Hundreds of thousands of ducks come here each and every winter. Those ducks — mallards, pintails, sprigs, spoonies, and others — are among almost 230 species of wildlife, including 50 species of waterbirds, supported by California riceland. The 500,000 acres of rice fields in the Sacramento Valley are an important part of the Pacific Flyway, which extends from Alaska to the tip of South America. According to Ducks Unlimited, as many as 7 million birds come through the Sacramento Valley each winter, and they get nearly 60% of their food from flooded rice fields. 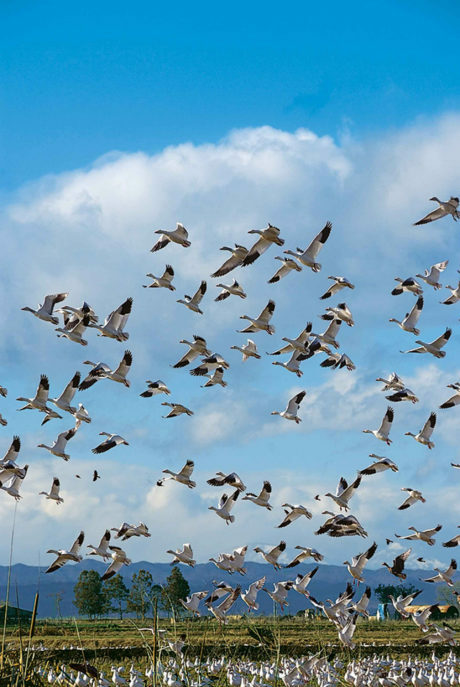 More than 1 million snow geese fly from Alaska to winter in the Sacramento Valley. When my father’s grandfather came from France to Sutter County, this area was still known for its wetlands and its birds. Today, 95% of the original wetlands are gone. We’ve found that the rice fields, which are part of the Sacramento Valley’s unique mosaic of farmland, are a good substitute. They serve as surrogate wetlands. Our water management practices have evolved over time. As they’ve evolved, we have developed practices that have helped us solve agronomic challenges while we enhance habitat. Rice has been grown in the Sacramento Valley for more than 100 years. The normal practice was to burn the straw after harvest, then flood your fields and invite duck clubs in to hunt. By the 1990s, in a state where at that point you couldn’t even smoke in a restaurant, it was evident that this practice wasn’t going to be able to continue at those levels. So the California rice industry worked with the state legislature to ramp the practice down. At this time, there is no burning in the Sacramento Valley with the exception of a limited amount of acreage with disease — a very small percentage. Instead, we harvest and chop the straw. Then we disk it and turn the water on. We run a stomper, like a series of metal baskets, to push the straw into the mud. Basically, we create a mud flat. The birds love them. Nicole Montna Van Vleck stands on a berm between two rice fields. She and other rice farmers keep thousands of acres flooded into the spring, providing wetland habitat for birds. The birds are in there walking around, pressing the straw into contact with the soil. The organic matter the birds provide is important, too — we are able to use less fertilizer. And in the spring, we have very little straw to deal with. Meanwhile, we’re capturing rainwater. It’s intensive and efficient. The California Rice Commission formed a collaboration with The Nature Conservancy, Audubon California, Point Blue Conservation Science, Ducks Unlimited, and the USDA Natural Resources Conservation Service in 2008. Ducks Unlimited and The Nature Conservancy have the ability to put together good studies, accumulate good data, and formulate conclusions based on good science. 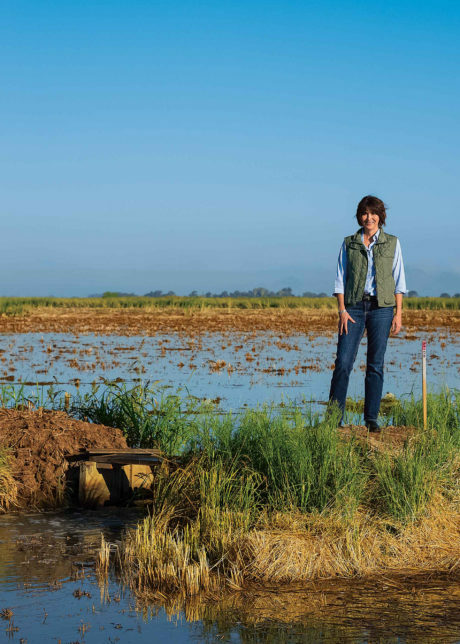 With that foundation, NRCS funded the $10 million Waterbird Habitat Enhancement Program (WHEP) to enhance habitat on 100,000 acres of California ricelands. They determined that WHEP could be funded for hundreds of years for the same amount of money it would take to purchase similar land and convert it back to wetlands. On our farm, we’ve really tried to drill down to our historical planting dates and try to make the habitat program fit what we do already. It’s also great in talking to our customers. Sustainability is important to buyers. 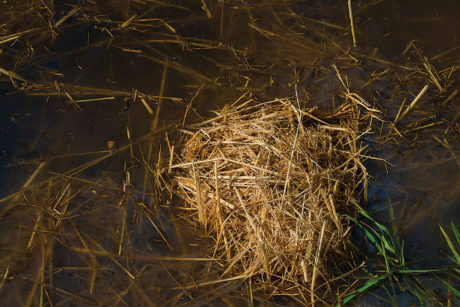 Farmers manage heavy rice straw while nourishing waterfowl, shorebirds, and waders migrating through the Central Valley. WHEP and a privately funded program from The Nature Conservancy, BirdReturns, focus on extending the availability of our surrogate wetlands. We flood in the fall for winter migration, then stagger the dates when we drain our fields to leave more habitat available for millions of birds migrating in the spring. Rather than draining everything on Jan. 1, farmers keep thousands of acres flooded into March, at a range of depths. We also set up the first conservation easement of its kind with Ducks Unlimited, which purchased the development rights on 1,200 acres. We provide the water and flood these fields every year. We are still in control of the property, and we know this ranch will always be here for agriculture and the birds. In fact, it worked out so well we created another easement with The Nature Conservancy. Of course, we’ve still got a long way to go with some of the people who make regulations that affect agriculture. We have to show them what we do is so important for the environment. I always think when you have an opportunity to coexist with whatever habitat is nearby, you’ve got the possibility of a win-win. It can prove, as we’ve proven here, that agriculture is about more than just providing a high-yielding crop, more than just returning back to the farmer. It’s about returning something back to the earth that sustains the farmers that will be here in the future. It shows the value — and increases the value — of agriculture. Read more stories from the "Why We Care" series below.